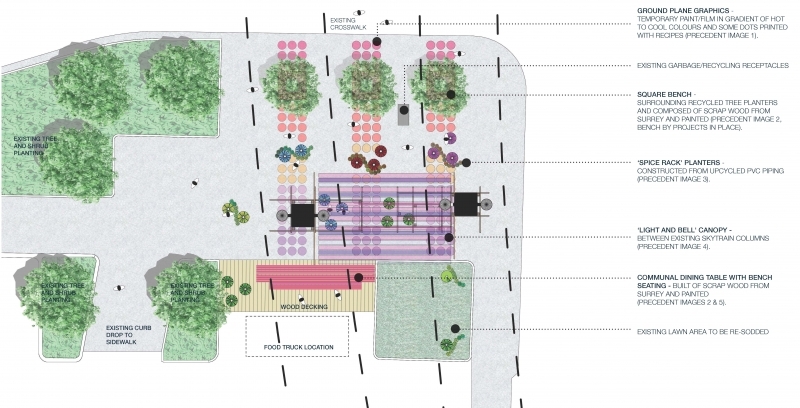 The 2013 PARKit Design Competition was a public call for the design and installation of a summer-time pop-up park located adjacent to the Surrey Central SkyTrain station, in the North Surrey Recreation Centre parking lot. Individuals and groups were invited to submit their ideas for a creative sustainable outdoor public space capable of supporting mobile food vendors. A group of Projects in Place members teamed with Landscape Architect Amy Tsang and designed a very interesting proposal that celebrated Surrey’s greatest gift and most precious endowment - its diversity, its people and people’s love for food. This is how the Spice Market idea was born and was conceived as a place where food comes alive through plants, colours and materials that transform the space into a sensual experience. A sequence of innovative seating, colourful canopies and undulating living walls form a cacophony of colour, light and sound invoking the bustle, energy and variety of an open air market. Celebrating the culinary diversity that thrives in Surrey emphasizes that the city is made up of a wide diversity of languages, customs, cultures and beliefs. Projects in Place wants to congratulate the team of the winning proposal “Take-out”. Great job! Projects in Place and Amy Tsang LA take second place in Surrey ParkIt design competition!